Last Wednesday in Denver, President Barack Obama, barely 36 hours after Rex Nutting's rubbish about his administration's spending performance hit the tubes, mangled what the MarketWatch global commentary editor had written: "My opponent won’t admit it, but it's been starting to appear in places -- real liberal outlets like the Wall Street Journal -- (laughter) -- since I’ve been president, federal spending has risen at the lowest pace in nearly 60 years." "Since I've been president"? I should note that MarketWatch, like the Wall Street Journal, is part of the Dow Jones & Company consumer media group component of Rupert Murdoch's News Corporation empire. They are hardly one and the same, as Obama's laugh line assumed. It should surprise no one, given the obvious lack of analytical rigor, to learn that MarketWatch's lineage and Nutting's tenure go back to when it was operated in partnership with CBS News. If Mitt Romney had made a similar mistake, we'd still be hearing about it. The next day in Iowa, Obama rephrased his misstatement: "But what my opponent didn’t tell you was that federal spending since I took office has risen at the slowest pace of any president in almost 60 years." That evening in Redwood City, California, Obama completed what he and his advisers must have seen as the oratorical equivalent of a hat trick, telling his audience: "[S]ince I’ve been president, federal spending has actually risen at the lowest pace in nearly 60 years. It usually takes a Democrat to fix these problems after they have run up the tab." "Since I've been president"? As Ronald Reagan would surely have said if he were there: "There you go again." Liberal and leftist pundits and apparatchiks have, while capitalizing on Nutting's work, "somehow" missed Obama's total recast. On Monday, in perhaps the most egregious example appearing three full days and change after Obama's third "since I've been in charge" equivalent, Eugene Robinson at the Washington Post ignored them all while claiming that Romney is the one who has a problem with the truth. That funny, because Post fact-checker Glenn Kessler gave Nutting's narrative and White House spokesmouth Jay Carney's use of it on the morning of May 23 -- hours before Obama began maiming it beyond recognition -- three Pinocchios. Maybe it was due to haste to get away for the Memorial Day weekend, but the editorialists at two usual reliables, Investor's Business Daily and the Journal, failed to grasp the significance of Obama's utterances. Both beat up on Nutting over his laughable assignment of so much of Obama's fiscal 2009 excess to George W. Bush, hit hard at how spending as a percentage of the nation's economic output has reached a post-World War II high, and noted how Obama has wanted and still wants the government to spend far more than it currently is. But both publications missed the obvious: By going to his "since I've been in charge" schtick, Barack Obama has taken ridiculousaurus Rex's nuttiness off the table. While the MarketWatch writer twisted himself like a world-class female gymnast in pushing as much of the blame for spending as he possibly could onto Bush 43 -- even acting as if the Texan's ghost was haunting the White House over eight months after he physically left the place -- Obama on the three separate occasions identified above took responsibility for everything that has happened since he was inaugurated on January 20, 2009. That makes things so much easier. 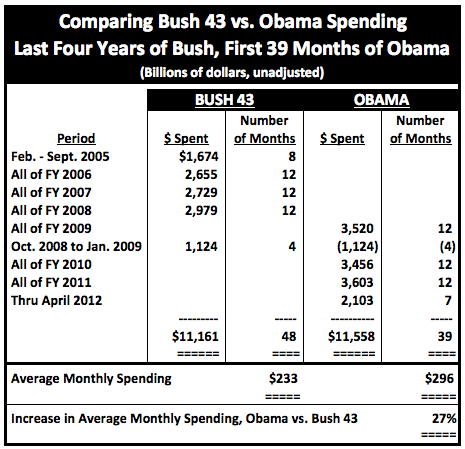 Now we can present Obama's spending record in terms anyone can understand, with only one set of self-inflicted, self-incriminating adjustments required.